Losing hair is like the nightmare for women as hair is part of their identity so it is quite obvious to get worried after noticing the abrupt hair fall. Even when women notice excessive hair loss or thinning of hair then they get panic. In such a panic situation, women try various hair care products and the treatments that could restore their valuable asset. Surgical hair transplantation is among the best option for females as it will give them lifetime assurance for hair restoration. In the earlier days, it was the perception among all that hair transplant is only for the men but today’s advanced procedure has made it possible for women to get hair restoration without being noticed. This procedure can work in the same way as like in men but only there are few kinds of hair loss situations in which this procedure can work effectively. 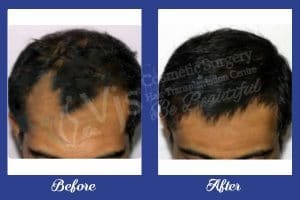 HOW IS WOMEN HAIR TRANSPLANT DONE in VIZAG? In case of female hair transplant, our team put extra efforts and care for extraction of grafts so that there could be no damage to the donor area. Extraction of grafts is done on the basis of requirement for density and desired look. DIFFERENCE BETWEEN TRANSPLANT IN MEN AND WOMEN? Shaving of head is also issue in case of females so the surgeons have to perform transplantation with extreme care and state of art.